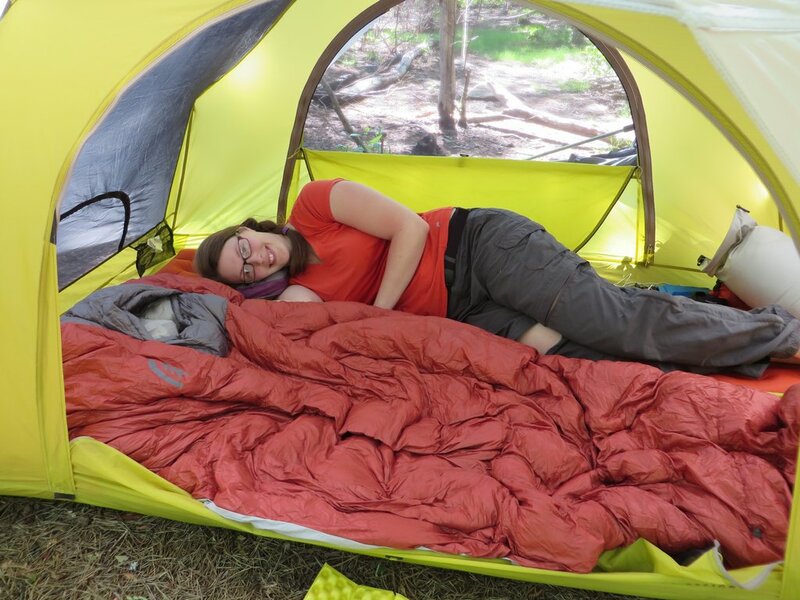 The Sierra Designs Flash UL 2 is a backcountry palace. Designed for maximum livability, the Flash has two doors with protective awnings above, massive amounts of head room, and two gear storage compartments located out of the way at the head and foot of the tent. The Flash weighs 4 lbs 10 oz, and provides nearly 30 feet of internal living space, ringing in at $399. There is also a cheaper, but heavier version of the tent that weighs in at 5 lbs 4 oz for $299. The flash is simply enjoyable to be inside. The hybrid single/double walls and clever pole design provides an impressive amount of living space for the weight. There is enough room for 4 adults to sit inside and play a game of cards comfortably. 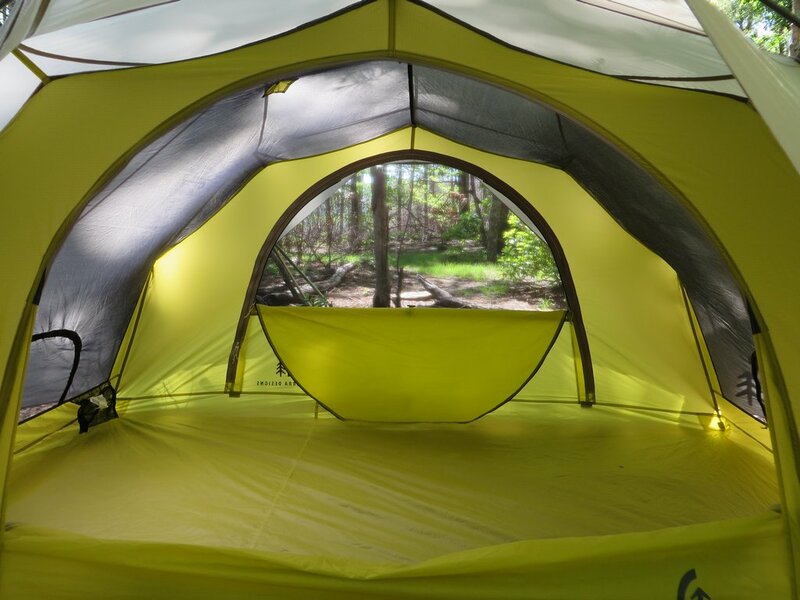 The uniform arches that comprise the circumference of the tent not only provide plenty of room above the head, but allow completely vertical walls for plenty of room to stretch out and move throughout, without the need to wrestle with your camping partner for deep woods real estate. 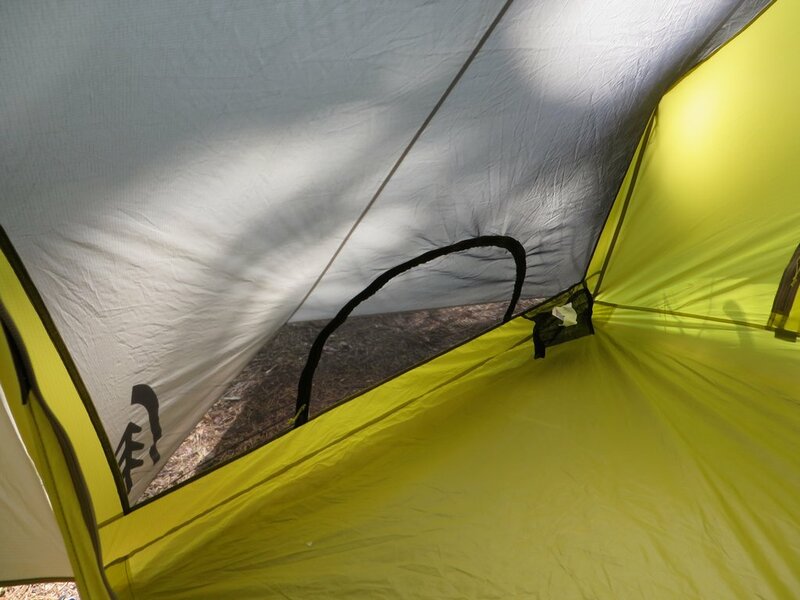 The tent is light enough for longer journeys at 4 pound 10 oz, and packs down fairly small. Build quality, despite the weight, is fantastic. I pitched the tent on a deep bed of sharp pine needles (a few of which made me bleed via impalement) and I had no issues at all. Beefier build means you can leave the footprint at home, essentially shaving some pack weight off your tent. The tent is designed with two large doors, which provide quick and easy entry. 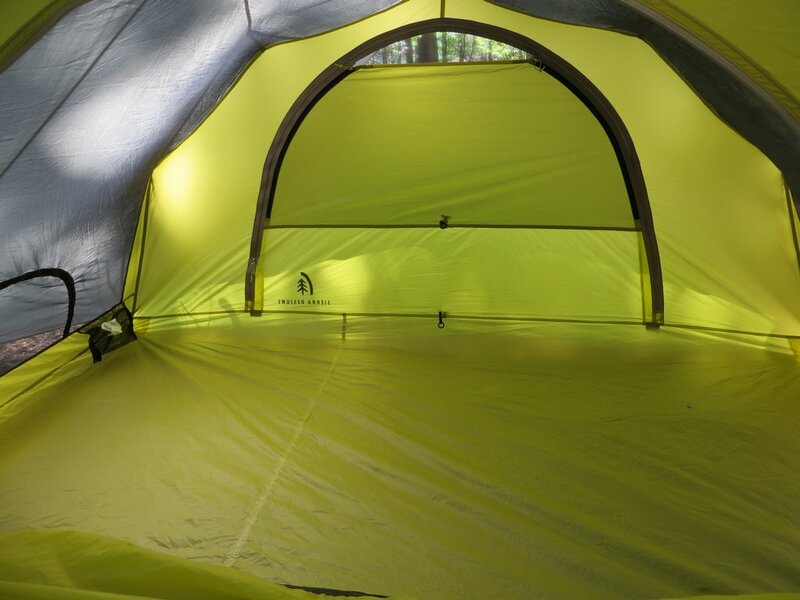 Above each door is a large awning, which allows you to unzip the waterproof barrier on the door it, revealing a screen window, and watch the rain during stormy weather, without risking water coming into the tent. This is refreshing, and makes for a tent that feels more like hanging out on your front porch than hiding away in a bunker. It takes a normally bothersome situation, and makes it enjoyable. The way rain should be. The doors, even when completely zipped up, have good sized vents on the top, allowing for extra ventilation and a peek outside. The storage space on the tent is located at the head and feet of the tent, with large zippered entries available at each so they’re accessible inside and outside the tent.. Storing the gear here means you won’t be climbing over your gear getting in and out of the tent. This combined with the luxuriously large doors allow for the easiest entry and exit of any backpacking tent that I have ever tested. The size of the gear closets are more than adequate, holding my backpack, cooking supplies, boots, stove, fuel, and more under a single closet. The tent comes with quality DAC J stakes, and 4 guy out points. Staked out properly, the tent is surprising stable. I found myself accidentally stumbling into the tent with nearly my entire body weight against the vertical wall, and it held strong with little movement. Condensation so far has been absolutely minimal, thanks to plenty of ventilation and the ability to unzip the protective barrier on the tent doors, creating massive amounts of ventilation while still blocking wind and insects. The awnings have small poles in them which allows them to stand up more, providing more coverage. These are a little bit of a pain when packing the tent on the inside of your backpack. My primary backpack is actually just a bit narrower than these tiny poles, which means I have to pack the tent in a way that allows these to be vertical inside my pack. Alternatively, these poles are quickly and easily removed, which is what I found myself doing. This allows you to stuff the tent. It’s a minor quibble, and quick and easy to overcome, but it’s notable. The tent will not stand long without being staked out. 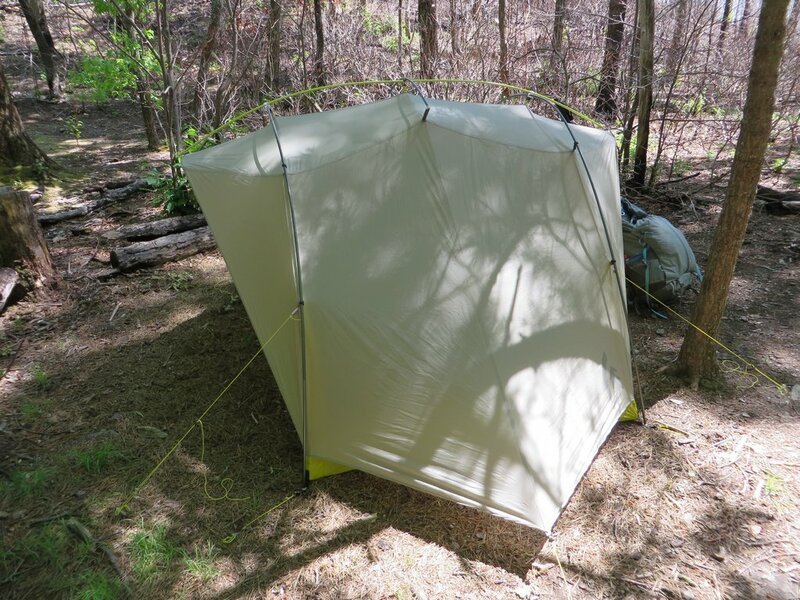 You should always be staking out your tent completely, but the structure and tension the tent provides on itself will actually make it cave in a bit on itself. Since you’re staking out your tent anyway, it’s not a deal breaker, but should be mentioned. 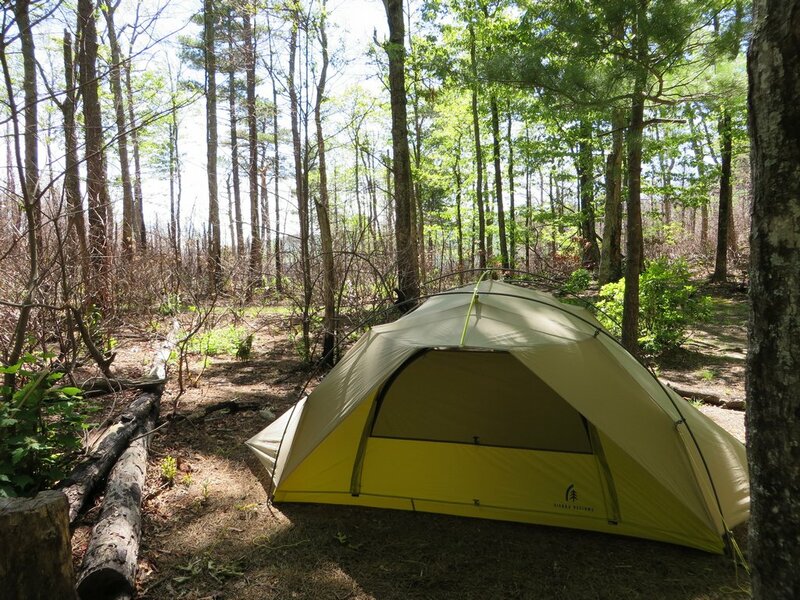 If you’re looking for living space, and a fairly light weight tent, this tent will not disappoint. Despite the massive vertical side walls, it is stable and quiet guyed out, resisting strong forces from every direction. Ventilation is amazing thanks to the large mesh windows in the doors and at the head and feet, which provides for fantastic condensation management, even on hot east coast nights. Entry and exit is the simplest I’ve used, and spending hours inside the tent is a pleasure, instead of a chore.